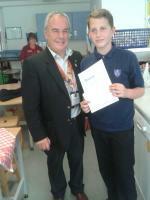 Rotary Young Chef, Rotary Design Awards, Rotary Young Writer. Each year the Club holds a competition in a local school. 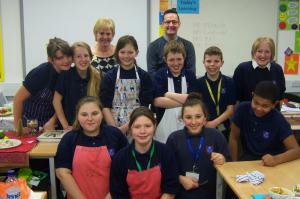 The students are asked to produce a 2 course healthy meal as economically as possible. The winners from our competition go on to enter the District competition and then, via a regional round, to the RIBI Rotary Young Chef Final. Here are the judges marking the food, which the students have just produced. Enterprise week in schools is marked at Countesthorpe College with a Day of Enterprise, including our Rotary Young Chef Competition. One year the winner's meal was a cocktail of Melon and Grapes, followed by a Smoked Salmon Quiche and salad. The judges praised the meal for its flavour and delicate handling of pastry. The chef judge then offered to assist the student with the preparation and development of her dishes for the District Final, at Samworth Academy. The runner up produced Stuffed Red Peppers and a tasty Bean and Vegetable Casserole. This competition aims to encourage students to develop their creative writing skills. Our club usually works with local primary schools and invites the schools to enter pieces of prose and poetry. Our winner is then entered for the District competition. This competition helps encourage Young Design talent and inventiveness. 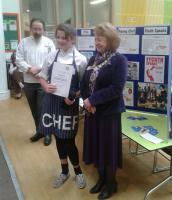 1st round of Young Chef Competition took place at Brockington College. Esther Buick represented the Rotary Club of Blaby Meridian & Brockington college at the local finals held 1st February at Samworth Academy. She was the youngest competitor on the day competing against 10 boys and 5 girls from South & west Leics schools.